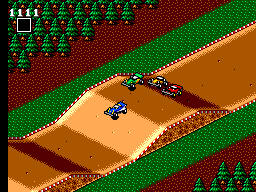 The best way to describe Buggy Run to someone who has never played it before is that it's a cross between RC Grand Prix & Super Off Road. If you've not played either of them then..... er..... I suppose I should elaborate a little! I LOVED RC Grand Prix back in the day. Both my brother and me were addicted to it for a LONG time. 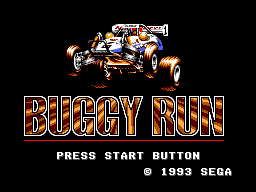 So when I heard Buggy Run was coming out I was psyched. So how did it pan out? Well the presentation and options are - simply put - awesome. Before you race you can purchase things for your car such as upgraded engine, tyres, transmission (gearbox for those of us in the UK! ), suspension etc. 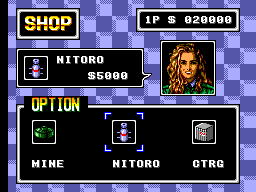 plus spare nitro boosts and some other cool items. The better you do in the races, the more money you get and the more you can afford to upgrade your car! You have to be wise though, because you can't do it all at once! On to the gameplay..... Fantastic. It has the speed and options of RC Grand Prix, and is smoother than Super Off Road with better matched computer opposition. The game is pretty easy on the easiest setting - but even then you will probably still finish 2nd or 3rd on one or two races if you make a couple of mistakes. On medium there is a good challenge, but after practice you'll definitely come out on top, and on hard it really does take some beating. But the important thing is that there is no frustration involved in the difficulty. You don't ever feel cheated - if you lose, you lose on your own mistakes - if you win it's because you concentrated and fended off a good few challenges each lap! Overall there is a real feel-good factor to the gameplay. When I first played the game I was admittedly a little disappointed with the graphics - they really are nothing special. There isn't much detail at all, BUT..... it is one of those games where after playing for a while you just kind of forget about the graphics as you get more and more addicted! As it is, the action is smooth with no flickers and the courses are colourful enough. The best thing to say really about the graphics is that they do the job and don't take anything away from the enjoyment factor this game has. The sound - as always the weak area of the Master System isn't too bad really! There isn't anything amazing, but nothing is annoying or grating in any way. It is pretty much just standard racing sounds and as good as you should expect. The controls are great, having a similar feel to both of the games I made comparison to earlier. All you should expect from a racing game is that the car/buggy moves when you want it to move and goes where you want it to go - and here there is nothing to complain about! Lastability and replay value could probably be explained in the gameplay section. The challenge is good so you won't beat the hard mode for a good long time, although you WILL want to come back and keep trying until you beat it. The game doesn't get boring and it always feels good to know you've won another race. The only time I can see people not wanting to come back to the game are those who when they got it only stuck it in for a few laps, didn't give it a fair crack of the whip and turned it off because they may not have thought the graphics were amazing (I like to refer to these people as 'game shallow'). If you give it a fair try you'll get a lot back and will have years of fun with it. Overall, this is probably the best racing game for the system except for F1 by Domark. It is certainly the best racing game of this style (a la RC Grand Prix & Super Off Road). Get it if you can find it - play it if you already have it!